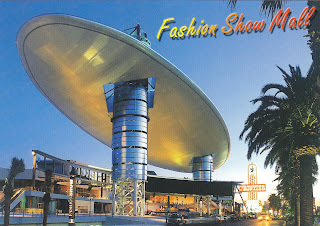 Postcard US-3677822 to Brazil shows the Cloud, a plaza that faces the Las Vegas Boulavard in front of the Fashion Show Mall, an over-250-store shopping mall first opened on Valentine’s Day, February 14, 1981. The main attraction is a 80-foot retractable runway in the central atrium Great Hall that can be used to host fashion shows. Currently, in celebration of ReCon 2016, the global convention for the shopping center industry, fashion shows featuring 10 of the mall’s retailers are scheduled at 12:00 pm, 1:00 pm, 2:00 pm, 3:00 pm, 4:00 pm, and 5:00 pm through May 30, 2016. Saturday, May 21: U.S. Polo Assn. Digital dance shows and live performances art by Girl Power Digital Show and Uptown Dance Funk are scheduled at 12:30pm, 1:30 pm, 2:30 pm, 3:30 pm and 4:30 pm on select days through May 30, 2016. Another copy was sent to Finland as US-3682362. Although this place is probably not cheap, but they are centrally located, have fabulous staff and delicious food, and most importantly, the best views of the city. I would definitely recommend these NYC venues for any kind of fancy event – all my friends talked about throwing parties here only.